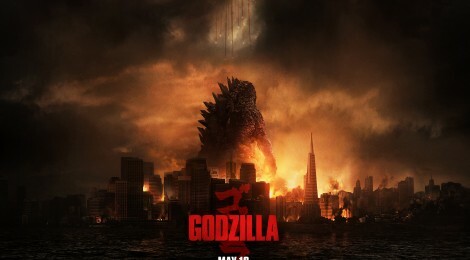 Movie Review - Godzilla - Honk if you love justice! Japanese kaiju (or giant monster) movies have been part of my pop culture since I was a kid, and my older brothers watched the various Godzilla and King Kong movies. Though I probably got the most enjoyment from the Gamera movies as they appeared on Mystery Science Theater 3000. Even without Pacific Rim appearing on the scene, you knew there’d be a ‘reboot’ of Godzilla for American audiences, the question is, would it be better than the deplorable 1998 version? For me, it’s a qualified yes. The story focuses on the family of Joe Brody, played by Bryan Cranston. Joe and his wife work at a Japanese nuclear plant experiencing some odd, rhythmic seismic activity. Joe sends Sandra (criminally underused Juliette Binoche) and a team to investigate the sensors giving the reports when disaster strikes. Joe is forced to seal his wife and her team inside to protect everyone else from an explosion. Cranston and Binoche sell the heck out of this, and it works. Fast-forward 15 years, and the Brodys’ son Ford is making a life for himself as a Navy man, in Explosive Ordinance Disposal. That won’t come in handy or anything! Unfortunately, his dad hasn’t been able to let go of what happened, getting pinched trying to sneak in to the quarantined area. Joe convinces Ford to go back one last time to secure data he recorded that will prove his crackpot theory of what happened right…and they both get caught. This time, they are taken into a secret facility where scientists (including Ken Watanabe, who I could listen to read the phone book) are studying a massive chrysalis. Being movie scientists, they accidentally hatch the thing and the first MUTO lays waste to the facility (and Joe). MUTO is an acronym, mind you, and not just something that sounds like what you’d name a monster. The survivors at the base get taken to an American aircraft carrier which is trying to follow the beast. But never fear, Godzilla is here! Dr. Serizawa (Ken Watanabe) has a theory that Godzilla is nature’s way of balancing things out. He rises from the depths to smack up anything that might wreck Mother Nature, other than us, I guess. Maybe we’re next. Here is where things go sideways a bit for me. There’s two ways a movie like this can go. One, you go full on MONSTERS WOOO mode, or two, you focus on the people surviving the crazy stuff. This movie never made a choice. It didn’t focus on the fights – more than once it cut away early from a fight or showed it small on a TV people were watching. On the other hand, we didn’t feel much for our stalwart hero other than “Gee, it’s really lucky that a bomb disposal guy is just hanging out right where he’s needed”. It did lead to one scene where Godzilla falls to the ground, and our hero Ford shares a look with him like “Ain’t this something? Shoulda stayed in bed!”, which had me laughing out loud. Anyway, this review is late, but I did enjoy the movie. It certainly is a solid take on the classic Japanese version of the monster, and does well to ignore the American Godzilla of the late 90s. Should be at your second-run theaters soon.